The theme for Heritage Week 2015 in British Columbia is Main Street: At The Heart of the Community. The Coalmont Hotel is still the defining structure of Main Street, and our town. 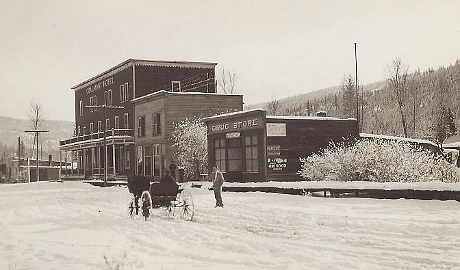 The picture below shows the original bank and drug store which are long gone because it is more practical to go elsewhere for those services. In their place we now have the splendid log home built by the Goodfellows. Along the way we have the Mozey-On-Inn, the office of which is a heritage building and the motel addition is in heritage style. Like many other places in BC, our Main Street has followed the history and evolution of a community.